Ghyll Royd School and Pre-School pupils got fully engaged with British Science Week! 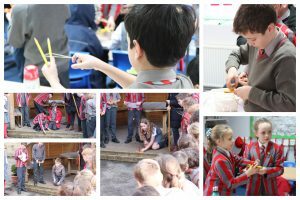 Children across the school participated in experiments, practicals and lots of outdoor learning to celebrate the STEM subjects. Firstly, our youngest children had just finished learning about all three primary colours to take part in a fun science experiment. 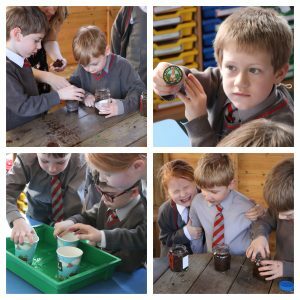 The children added vinegar to pots of baking soda to unveil the hidden colour underneath! 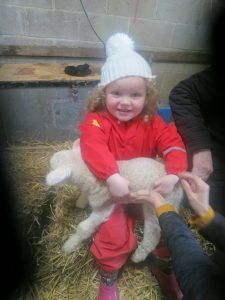 Later in the week, the children visited Zoe’s farm to meet and feed the newborn lambs! There was even a lamb called ‘Ghyll Royd’ that the teachers wanted to take home with them. Great Explorers were joined by Form 6 who helped them with three different experiments. The children paired up and worked together on three different activities. One group poured paint onto paper and with their buddy they blew the paint across the page. Meanwhile, another activity involved assembling skittles around a plate and adding water to watch the colours run into the middle. The final experiment was ‘magic milk’ where the children created fireworks in a bowl by adding washing up liquid to milk and food colouring! Reception started their paper mache planets as they continued their space topic! Mrs Hudson and Mrs Ellis were over the moon with their show and tell space facts. Some of the Great Explorer children joined in with Reception and made rockets with Miss Brown! Forms 1 and 2 planted seed they had bought after their school trip to Harlow Carr! They put their pots in water and watched the compost soften before they added their seeds. Outside, the children told stories using natural items from the forest floor that they had transformed into characters and props using their imaginations! Together, Forms 3 and 4 created the digestive system by mixing food and drink together and squeezing through a pair of tights. This fun and hands-on practical gave children a much better understanding of their bodies and how food is digested. 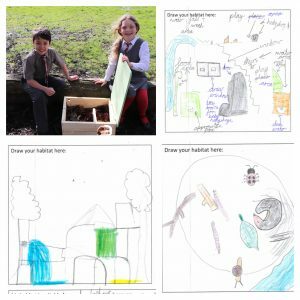 Form 3 designed their own animal habitats and looked for key factors needed to help an animal survive. 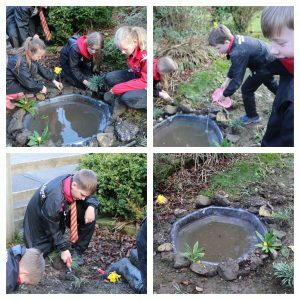 In the school grounds, they had added leaves and food to the hedgehog house which was provided by Learning through Landscapes! 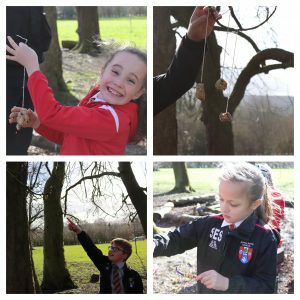 Form 4 made bird feeders from lard and bird seed. Mr Laycock helped the children reach the branches so they could hang the bird food from the trees. Form 5 set sail on Science Week with a water practical. The class talked about water molecules and how objects float. Adding washing up liquid to the water molecules decreases the surface tension. The children added their boats to water and Mr Nicholson dropped in the washing up liquid which propelled the boats across the water. On Outdoor Science Day, the class made toad houses underground by the new pond. They collected stones, twigs and other materials, dug holes and covered with the sticks and are now creating signs for the homes. Form 6 got up to all sorts of terrific scientific fun! The children made heart diagrams out of salt dough then painted their finished pieces. In addition to their learning topic, the class took a balloon, a cup, straws and sellotape and demonstrated how blood pumps in and out of the heart! Outside, they filled the new pond with water and planted flowers around the outside to brighten it up. This week they will be adding frog spawn! To finish, British Science Week wrapped up with a competition! In their houses, the children made three catapults. The aim was to catapult the object as far as they could so their designs had to be strong with a tight structure to ensure a long throw. Well done to Drake who came first overall. To sum up, we had a lot of fun with Science Week. Above all, Ghyll Royd children improved their understanding of the human body and of animals and nature through practicals and engaging activities. A big thank you Science coordinator Miss Gresswell for planning an exciting week of learning.